We are delighted to announce the first of the ‘big’ conferences in CBA North region to you as Archaeology and the small finds of North-East England. This is one that we are jointly supporting with the Finds Research Group, our group member the Architectural and Archaeological Society of Durham and Northumberland as well as Durham University. 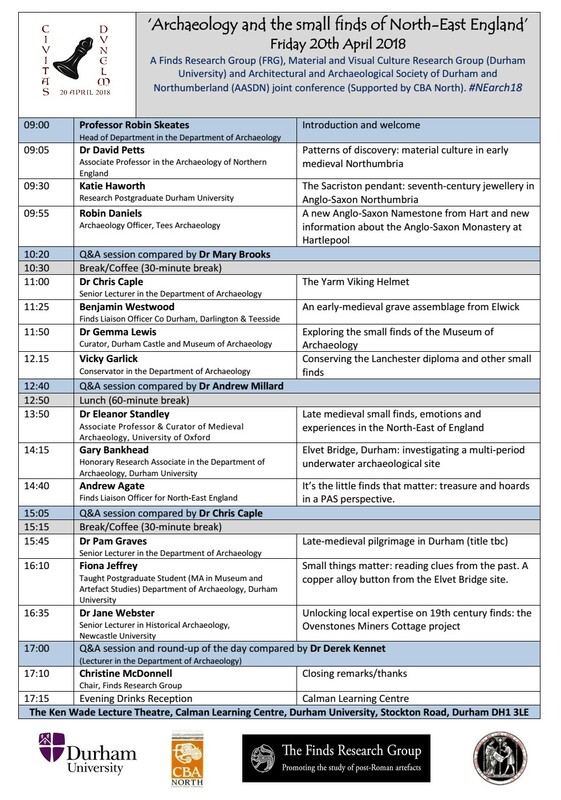 Below are details of the programme which covers all periods between the Anglo-Saxon and the 19th century, across much of our region from Coquetdale to Teesside (and just over into Yarm) where specifically named and more besides, this conference promises to be a most interesting and fully packed day. Details on how to book a discounted place as a CBA North member are given below, clicking on the posters will take you to the online booking page. In case you would like to forward this information onto others, please use the links in the left-hand portion of this email or you can send on the link http://www.aasdn.org.uk/NEarch18.htm. Various CBA North Committee members will be there, with various discounted books for sale from £2 to £20 on various topics as well, so feel free to have a word with us or at any other time. – The Finds Research Group promotes the study of artefacts from archaeological sites dating from the post-Roman period onwards. It is well-known, even outside finds circles, for producing many datasheets summarising particular classes of objects – some of which can now be downloaded from their website. – Durham University, and indeed its archaeology department, is no stranger to appearing in CBA North’s materials over many years. Current information on the department can be found online here. – our group member the Architectural and Archaeological Society of Durham and Northumberland will be already familiar to you as we’ve announced their various lectures in the past. As a follow-on from the conference on the following day their regular meeting is also given over to a finds-based theme; Dr Eleanor Standley will be giving the lecture Spinning yarns and skinning rabbits in the later Medieval period: new contributions to the archaeology of religion, sexuality and daily life. Readers will recall our last email carried the news of, and link to, a survey of community archaeology. The deadline for this survey has now been extended to Sunday 8 April 2018. Here is the link again in case you have yet to fill in the survey, or can send it to someone else, https://www.surveymonkey.co.uk/r/CBA_Community_archaeology_2018. Please fill in this survey if you have the time! 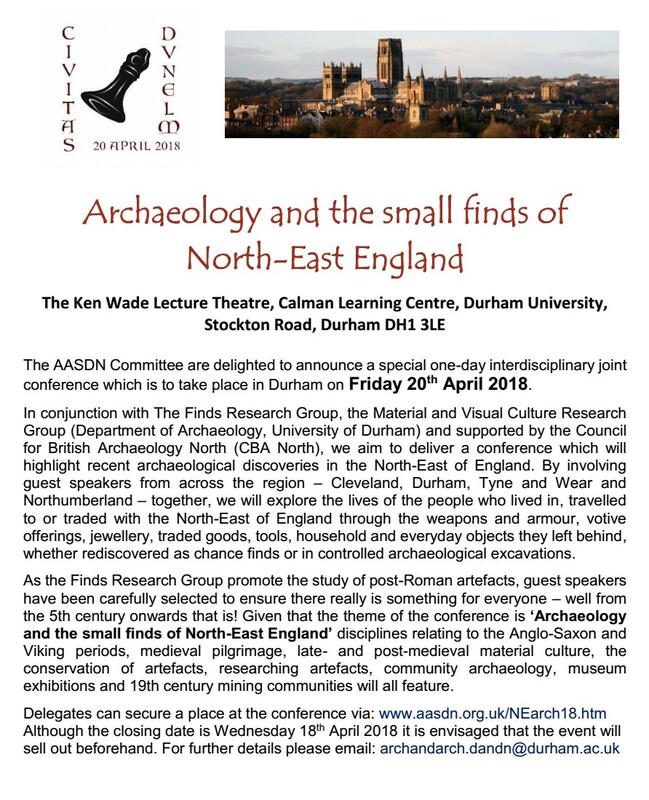 This entry was posted in E Newsletter and tagged AASDN, Anglo-Saxon, CBA North, conference, County Durham, Durham, Durham University, Early Medieval, Finds, Modern, Northumberland, Post-Medieval, Teesside on April 3, 2018 by cbanorth.